A 15-year-old boy died Monday afternoon after he was shot in San Francisco's Sunset District, a police spokeswoman said. Police got a call around noon regarding a shooting near Sunset Boulevard and Kirkham Street, according to police spokeswoman Officer Giselle Talkoff. The medical examiner's officer identified the teen as Reajohn Jackson of Daly City. Police say a car pulled up next to a white car being driven by the teen on the busy boulevard, and someone started shooting at it. People who live nearby say they heard six shots, and the car was riddled with bullet holes. A teenage passenger was not hurt, police said. 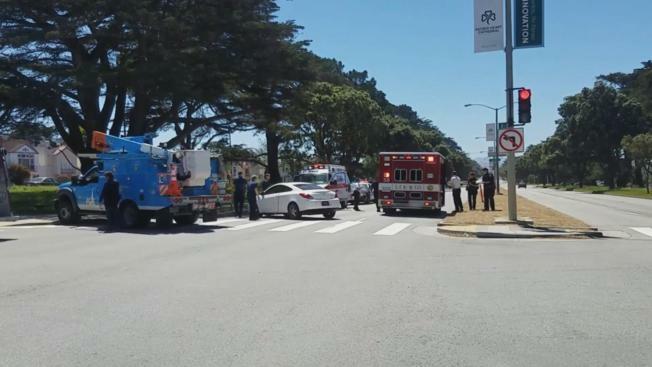 A teenager died Monday afternoon after he was shot in San Francisco's Sunset District. Jean Elle reports. Police say there is no suspect description or description of the suspect's vehicle. They say they believe Reajohn was targeted, but they don't know why. Neighbors were in shock that such a violent crime occurred so close to home. Rose Widness drove through the intersection moments after the shooting. "We went to the corner and saw the young boy lying there, and we didn't know if he was alive or dead," she said. "We thought it was a car accident. It's kind of scary. You don't expect things like that happening in your neighborhood." Investigators were hoping to find surveillance video of the car that explains what was behind the shooting. They said especially with cars, when they're moving, they continue to move a crime scene, and where it started and where it ended is then difficult to determine. Sunset Boulevard was closed between Kirkham and Lawton streets as police investigated the shooting, Talkoff said. Drivers were advised to avoid the area and use alternate routes. Anyone with information about the case is asked to leave information anonymously at 415-575-4444 or to text a tip to TIP411, beginning the message with "SFPD." Editor's note: San Francisco police initially reported the victim was 16 years old. They then updated the number.